Browse for bicycle chain by vehicle make and model. 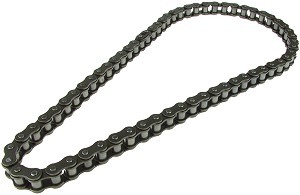 #415 chain is also known as #43, 083, and 1/2" x 3/16" chain. #415 chain has a 1/2" center to center spacing between each pin, a 3/16" spacing between inner links, and is approximately 7/16" wide. Heavy-Duty #415 chain is best suited for motorized bicycles and tricycles, freight bicycles, and heavy-duty tricycles. Standard-Duty #415 chain is best suited for light-duty pedal powered tricycles. #415 chain master link. The master link connects chain together into a continuous solid loop. 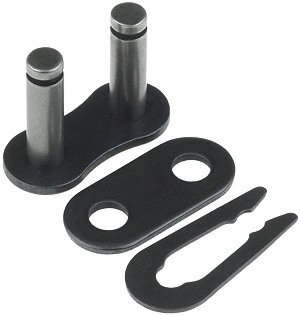 Master links also make it possible to remove and install the chain without having to remove the rear wheel. #415 chain half link. Also known as an offset link. The half link enables a chain to be lengthened or shortened by one link, as opposed to two links if a set of links was removed from the chain. The removable half link pin is held in place with an included cotter pin. #415 chain custom made to your specifications. Specify the number of links that you need and we will custom make that size chain for you. 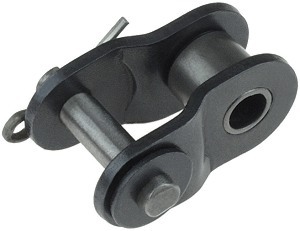 Remember to order a master link sold above to complete the installation. We stock and sell by the link heavy-duty and standard-duty #415 (1/2" x 3/16") bicycle and tricycle chain, master links, and half links.